Follow the beeps. But in reality it can be more difficult than that. First you must narrow the search area down. If you don’t know approximately where the model is, this may involve driving around with a helper and listening for the beacon transmissions (beeps). When the beep is heard, you can start direction finding. This will point you in the direction of the lost model. Lets say the last time you saw the model it was flying off over a hill towards the next valley. You will have to do some driving around and listening for the tracker signal. On a map you can draw a line in the direction of the signal from where you are. It could still be a large area to search. From another raised location do the same thing again. If there’s a convenient third location, do it again. Where the lines meet is about where the model is. Go to the general area and do it again with a less sensitive antenna. You will be getting closer all the time. The squelch, gain and attenuation controls determine how sensitive the receiver is. As you get closer to the model, the receiver must be less sensitive for direction finding to be effective. Begin with the squelch open so you can hear all the background noise. When first detected, the beeps will be faint and hidden in the noise. the human ear and brain are the best filters for detecting them. As you get closer, the beeps become stronger and you can rely on the squelch to block the noise and pass the beeps. At shorter distances, the beeps will be strong and overpower the direction finding ability of the antenna. The attenuator is used to reduce the sensitivity of the receiver, effectively making the transmitter appear further away and the antenna more directional. Keep tracking until you locate the model. The yagi antenna can be rotated about the boom to vary the polarization; vertical, horizontal and in between. This will also effectively attenuate the signal and helps a lot with direction finding. Find the strongest beeps then slowly rotate the yagi while listening to the beeps to narrow the direction. The strength of the transmitted signal depends on the position and orientation of the model. The range is less if it is sitting on the ground and more if it is up in a tree. You can see that the distance to the plane is not related to the strength of the signal. This is sometimes the most difficult part. At short distances a yagi is a bit too sensitive and does receive quite well from behind. The yagi is most useful at longer distances and can be very directional. You will need something to block the signal coming in from behind, so that the antenna can only see in one direction. At short range a simple short whip antenna and using your body to block the rear works reasonably well. Hold the antenna close to your chest and slowly rotate while listening for the best or worst signal. This works best outside on open ground or in wooded areas away from metal fences and buildings which tend to reflect the tracker signal and make it more confusing. Install the transmitter as if it was a black box flight recorder. You can’t find it if it doesn’t survive the crash. Ensure that the transmitter antenna is straight and not run parallel to wiring or metal push-rods etc. The antenna cannot be inside a CF structure as it will be shielded. Waterproof the installation. If it rains on the crash scene before you get there, the transmitter could be put out of service. The enable/disable jumper terminals do not nee to be waterproofed and can be external by using a wire extension. The yagi is more for long range tracking. At shorter ranges the body shielding technique is best. At shorter ranges buildings and vehicles will reflect the signal and make it harder to track to close in. The lack of signal or looking for a null is more effective than looking for the strongest signal at short ranges. Due to the way most receivers work, strong signals all look about the same and it’s difficult perceive small differences. 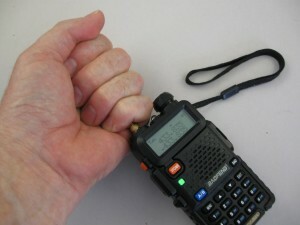 The body shielding technique is where you have a small or no antenna on the receiver, hold it close to your body and slowly rotate on the spot. Listen for the weakest or no signal. The beacon is then somewhere directly behind you. Repeat until you can home in on the beacon. I have never tried a circular direction finding antenna. The yagi becomes more directional as the distance increases. At 100 meters it should be working. It depends on the beacon position and surroundings. A cardboard tube covered with tin-foil, large enough to lover the receiver into, hanging around your neck can be used as a shield. The further the receiver is lowered in, the weaker the signal it sees. This enhances the body shielding technique. Important Note: As of July 2016 our tracker beacons are using a new transmitter module that also works better with the Baofeng receiver. Tune the receiver to 433.920 MHz. The earlier beacons transmitters work best at about 433.835 MHz. See This Page for more Baofeng tuning notes. The receiver should be working OK. You will need the squelch open to hear low signals and detect a null. 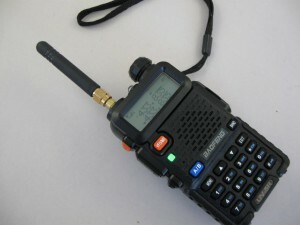 I have just done another test with my UV-5R radio. The headset earphone that came with the UV-5R is not very good at all with the tracker beep. Through the speaker, there is a lot of hiss but the tracker is audible. Using a small antenna and the body shielding technique and holding the antenna to shield it, I was able to get detect the tracker direction when only about 10 feet away. Adjust the volume on the radio to not be too loud. The hiss seems to override the tracker beep. Any small antenna should work, even a little wifi type. But do not transmit with the wrong antenna, or no antenna attached. It could damage the radio.